I’m a huge fan of Russian literature but I’ve read any Russian folklore before so I was interested to see what I’d think of this book. I’d heard some really persuasive reviews and I finally decided I couldn’t put it off anymore. From the first few pages I was hooked on Arden’s writing which so perfectly evoked the small Russian village community she was writing about. I felt myself completely there, feeling the biting cold of the wind and snow of their bitter winters and the creeping fear of the shadowy demons as they appeared. 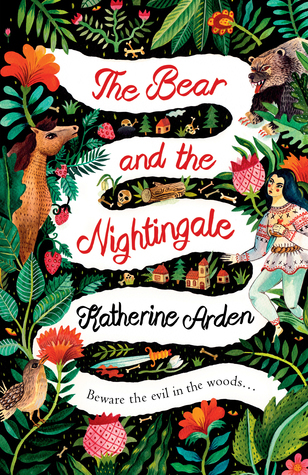 The Bear and the Nightingale is a perfect mix of historical fiction, fantasy and fairytale. The story flows beautifully, even though it’s a fairly slow burning story as the first in a trilogy of books. The introduction of the characters is masterful, the Russian folklore mixing with the slow creeping danger of the village men and Konstantin the priest who are so distrustful of Vasya’s strength and vivacity as a woman ahead of her time who has no intention of doing as she is told. I just couldn’t get enough of the rich Russian folklore or the wonderfully fierce character of Vasya, from young child to young woman. I can’t wait to continue with Vasya’s story and immerse myself back into the wonderful atmospheric tale Arden is weaving.